Mobile technology makes a lot of things easier: sending emails, talking to friends, playing games, hailing taxis. One thing it makes harder: staying focused on the road. With the Internet's culture of connection, friends, colleagues, and strangers are never more than a few taps away. For most people in America, driving is a chore, not a luxury. Taking the same route day in and day out leads to complacency and loss of attention. With all the time you spend driving, glancing down for a few seconds to skim a text from a friend doesn't seem like too much of an indulgence. While there's social stigma against drunk driving thanks to decades of advertising, texting and driving is more widely tolerated. Around 20% of high schoolers said they have ridden with a drunk driver, while a full half of all adults and teenagers said that they have ridden in a car while the driver was texting. Even though distracted driving can be as dangerous as drunk driving, 44% of adults said they had been in a car when the driver "used the cell phone in a way that put themselves or others in danger." As the drunk driving fatality rate continues its decades-long decline, the danger of distracted driving is worsening as smartphone usage increases. Between 2005 and 2012, the number of drunk driving fatalities per person decreased 28%. In the same time period, the percentage of people observed "visibly manipulating" their phones while driving increased a staggering 650%. The number of fatalities caused by distracted driving increased 28% between 2005 and 2008 alone. In 2012, 3,328 Americans died in crashes involving a distracted driver, while 10,322 people were killed in alcohol-related crashes. Unfortunately, drivers' lack of awareness puts them in danger, and teenagers are at the most risk. According to a National Highway Traffic Safety Administration study, drivers under 25 are three times more likely as older drivers to text while driving. Young people are less likely to consider texting and driving to be unsafe: 60% of 18-20 year olds reported sending texts while driving to be "very unsafe," compared to 95% for those over 45. Clearly, young adults are completely ignorant of how much their attention suffers when they check their phone for even a moment. To combat teens' tolerance of texting and driving, the NHTSA launched a frightening campaign designed to keep kids' eyes on the road. 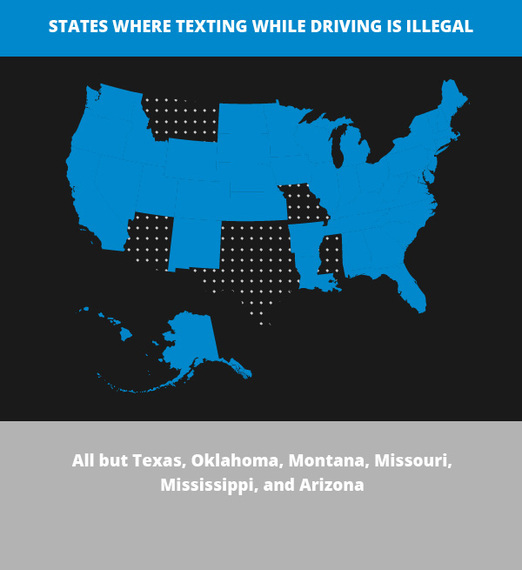 Today, most states have banned texting and driving. Since Connecticut adopted the first such law in 2006, 43 states and the District of Columbia have followed. The only holdouts are Texas, Oklahoma, Montana, Missouri, Mississippi, and Arizona. Even though most states outlaw texting while driving, the associated fines are usually far lower than those for drinking and driving, even though several studies show they can be equally as dangerous. In Massachusetts, the fine for drunk driving is 50 times the fine for texting and driving. 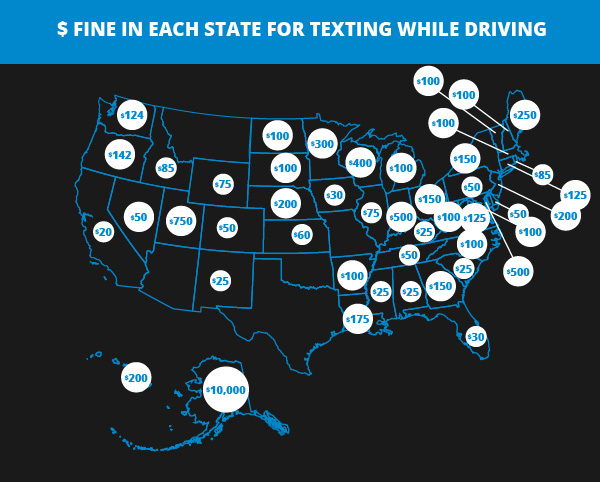 The only outlier is Alaska, where the fine for texting and driving is $10,000, when the fine for driving while intoxicated is only $1,500! Virginia is 9.5, Maryland is 8.6, and DC is 2.4, while the national average is 10.7. DC's relative safety is probably attributable to the fact that urban areas, where people walk, bike, and take public transit, are considerably safer when it comes to transit-related accidents than suburban areas, where mobility requires a car. Luckily for us Washingtonians, walking and texting is still legal.